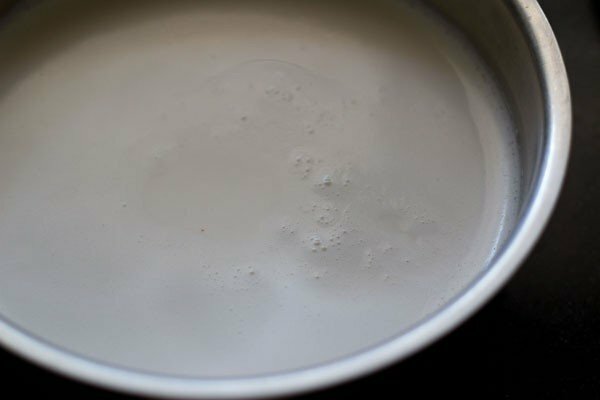 how to make coconut milk at home from scratch – since i make coconut milk often, here is a step by step post, which i thought would help many of you. this post has been in the pipeline for 6 months. 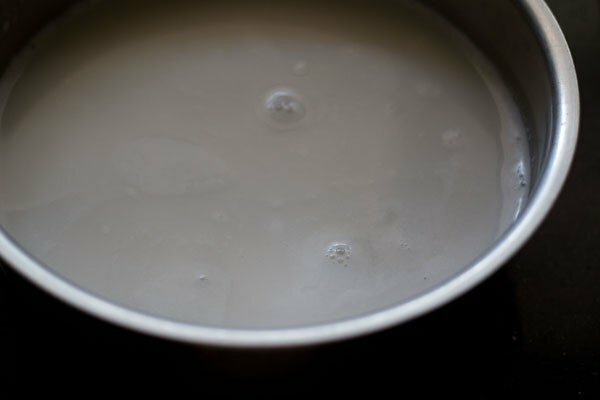 it has taken me so long to write something as simple and basic as preparing coconut milk, which i often use in my cooking. apart from adding it to the south indian curry recipes and payasams, i also make banana milkshake with thin coconut milk. and the milkshakes are really refreshing and light. 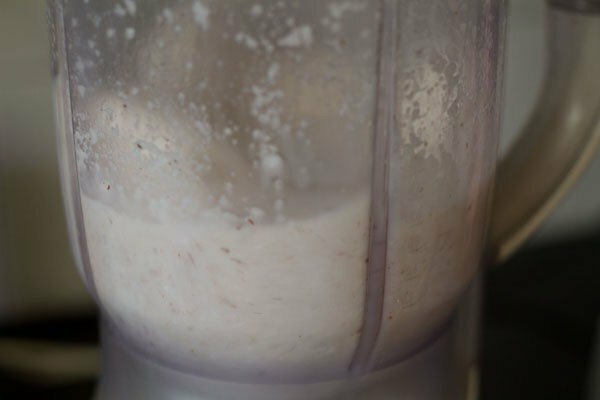 you can also check how to make almond milk. i always use fresh coconut to prepare coconut milk. the method is very easy. i always prepare 3 extracts. 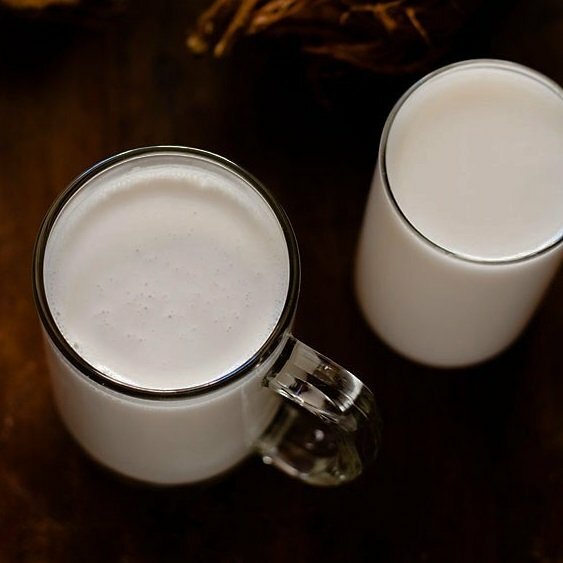 the last two extracts of thin coconut milk goes into curries or making payasams like moong dal payasam, paal payasam and sometimes into milkshakes. 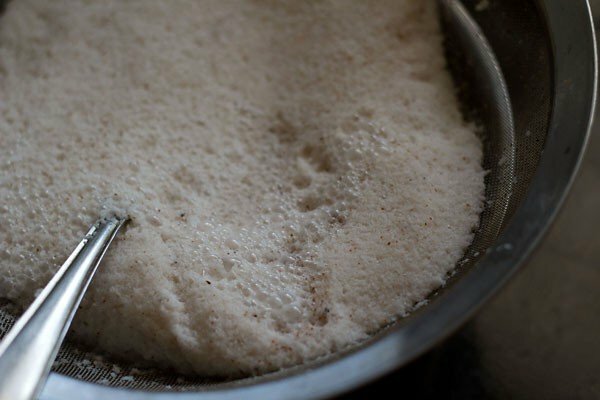 the first thick extract is added towards the end in curries or payasams. 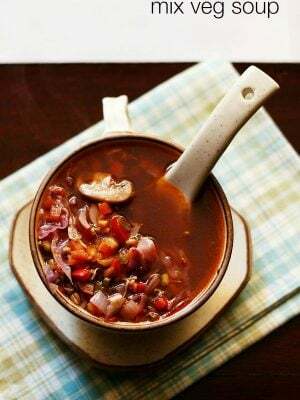 keep in mind, the 2nd or 3rd extract can be boiled or simmered, the 1st extract cannot be boiled. if you boil the 1st thick coconut milk, it will curdle. so before you get confused into 1st or 2nd extract let me take you through the process of preparing coconut milk. 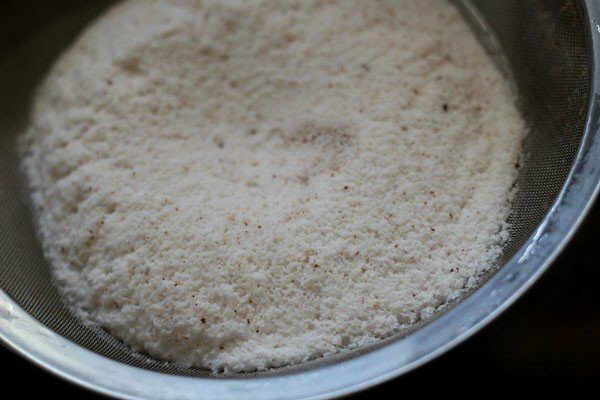 take all the grated coconut in a blender jar. add the 1 cup water and blend on high till the coconut is ground well. 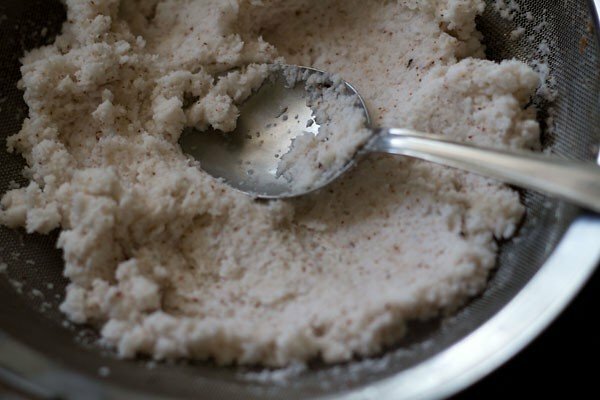 strain in a cheesecloth/muslin or a fine sieve and collect the first extract in a bowl or pan. this is the thick coconut milk or the first extract. then collect and put back the coconut residue into the blender. add 1 to 1.5 cups water and blend again. strain and collect this coconut milk in another bowl. this is the thin coconut milk or the second extract. put back the coconut gratings again in the blender. this is thinnest coconut milk or the third extract. strain for the third time and collect the third coconut milk in the bowl in which the second thin coconut milk is extracted. you can also keep the third extract separate. so the fresh coconut milk is ready. use it fresh in your cooking. 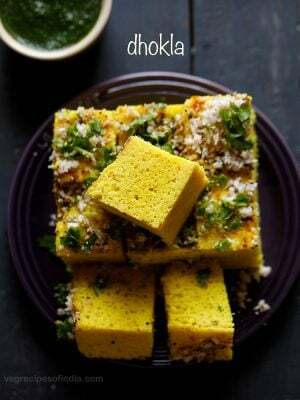 you can also refrigerate and use the coconut milk later. if using unsweetened shredded coconut, then preferable to soak the coconut in warm water for a few hours and then blend. 1: take a fresh mature coconut and break it open. collect the water in a glass and grate the white flesh with a hand grater. in india we also have a manual grater which has a seat and is used traditionally. here i have grated the white meat with a hand held grater. 2: take the coconut grating in a blender jar. add 1 cup water and blend till the coconut is ground well for a couple of minutes. 3: pour the contents in a bowl or pan lined with a thin muslin or fine strainer. 4: the coconut milk will be strained. 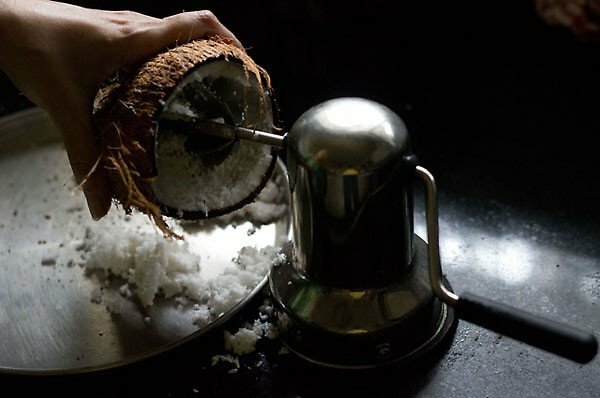 press with a spoon on the coconut shreds so that all the milk is strained away. 5: what you get now is the thick coconut milk or the 1st extract. i used this in chole biryani recipe. 6: put back the coconut shreds in the blender again. add 1 to 1.5 cups water and blend again. again strain the content in a different bowl or pan using the same strainer or muslin. press with a spoon on the shreds again. 7: this is the thin coconut milk or the 2nd extract. 8: you can stop here or continue to get the 3rd extract. proceed in the same way as for getting the 2nd extract. you can keep the 2nd and 3rd extract separate or mix them up. mostly when making curries, i mix the 2nd and 3rd extracts. 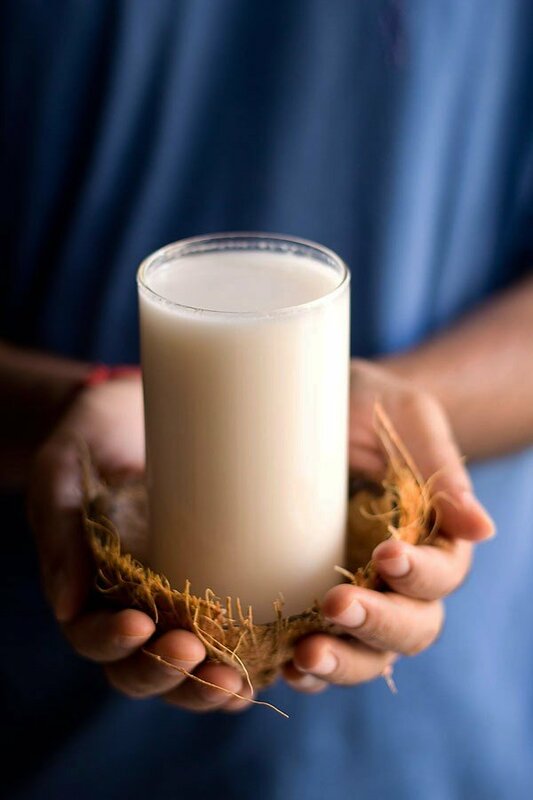 so now you have fresh homemade coconut milk ready which you can use in your cooking or baking. you can also keep the coconut milk in the fridge. it stays good for 3-4 days. you can add this coconut milk to mango milkshake or banana milkshake also. the leftover coconut residue can be roasted in an oven or a pan. then ground to a flour when cooled to give coconut flour. this coconut flour can be added while making cakes, cookies or breads. Can we mix normal cow’s milk and coconut milk and heat? 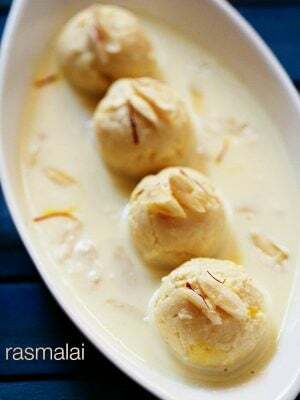 coconut milk can curdle on heating even if you mix with dairy milk. 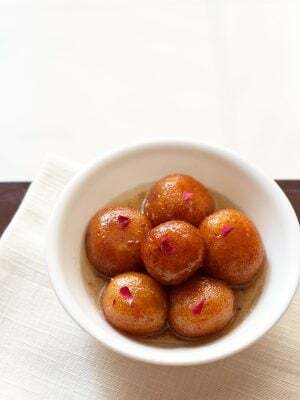 Hi.. Can i dilute the first extract of coconut milk with water and then mix with the other the extracts and heat it? Is it ok? Thank you so much for this amazing recipe. I have been buying coconut milk from market and it was real heavy on my pocket as Due to PCOS I m not allowed to consume dairy products. Now I will make it at home. How long can I store it??? take care surabhi of your health. fresh coconut milk can be stored for 3 to 4 days. after that it starts becoming rancid. alternatively you can freeze coconut milk and it will stay good for some weeks. If we are using food procceser for grating coconut shall we peel of the brown skin of the coconut ? Please reply soon as I am making daily coconut milk for a special diet plan. there is no need to peel the brown skin. i do not use a food processor for grating coconut. i use a table top grater. but i do not remove the brown skin. even when i use a grinder to grate coconut pieces at times, i keep the brown skin. Could you please tell me if i can use the leftover coconut residue for sambar or bhindi fry, something simple or cococut rice. 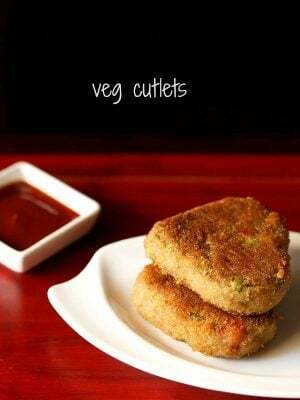 yes you can use in sambar and bhindi fry or any veggie stir fry. you can even make coconut based cookies or desserts with the remaining residue. in coconut rice, i am not sure how the texture will be. Such an easy way to get your very own pure coconut milk with no damn additives and preservatives. I had my oatmeal with homemade coconut milk and believe me I can’t explain how tasty it was. Plus I take a big cup of this milk every night as I am lactose intolerant and it tastes really good. Thanks Shoaib for your positive feedback. Its always better to prepare food items at home. Nice to read your feedback. 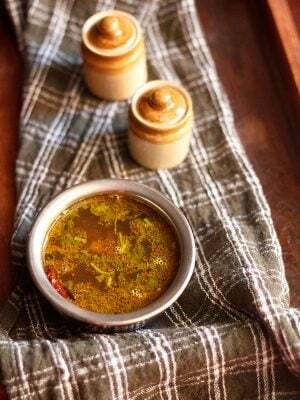 This is a really helpful recipe that will be very useful for all those wanting to get away from buying tinned coconut milk, some of which does seem that appetising given the additives. It might be useful to add preparation of the coconut: puncturing the three eyes, extracting the fluid inside, then burning off the whiskers on a gas hob, then hitting all around the nut with a hammer to detach the shell from the nut, then hitting along a consistent line to get an even half shell break. thanks seb. i do plan to add the preparation of coconut, but in a separate post. Can I use this coconut milk directly into popsicle moulds for my toddler? you can. if you want you can even lightly warm and then let it cool and then add. but just a lukewarm and not hot. Can we mke coconut milk from coconut milk powder? If yes, pls tell how! nashara, in the markets, one gets these packs of coconut milk powder, than you just need to mix with some water and make coconut milk. once i tried but i did not like the coconut milk from the ready made pack. i do not know if coconut milk can be made from desiccated coconut powder. Can i drink coconut milk, any extract from these 3 steps ? is it ok for pregnant lady? 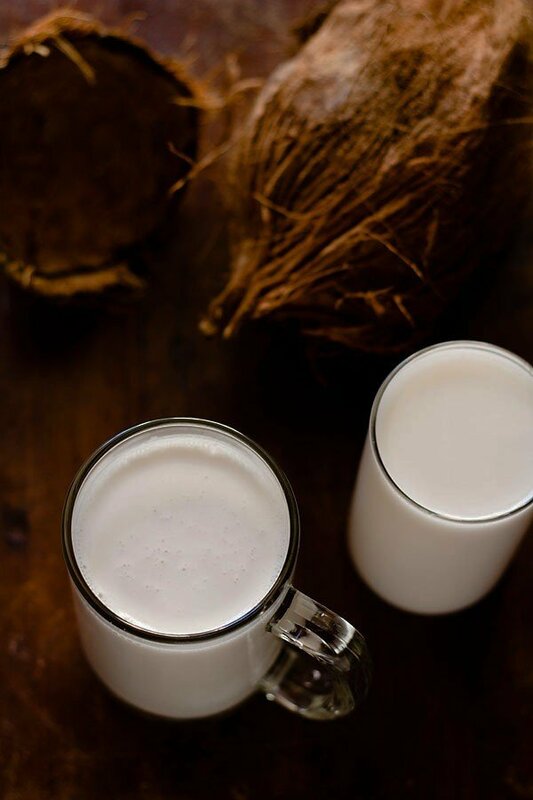 coconut milk cannot be drunk as it is. do include in it in some meals. eg you can mix some red poha with coconut milk and jaggery. 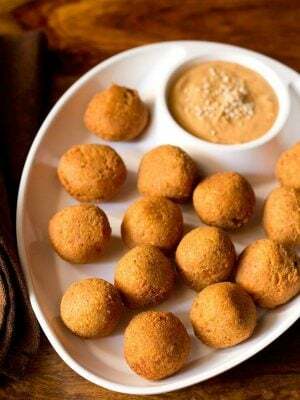 add some dry fruits and fruits like bananas or mangoes and have it. or you can make smoothies or milkshakes with coconut milk. with any extract also you can make smoothies. 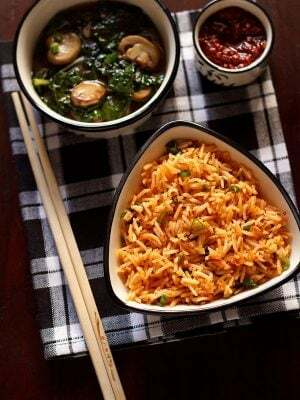 also you can add any extract or coconut milk in dishes like rice, pulao or various gravies/curries. it is fine for a pregnant lady.